Gov. 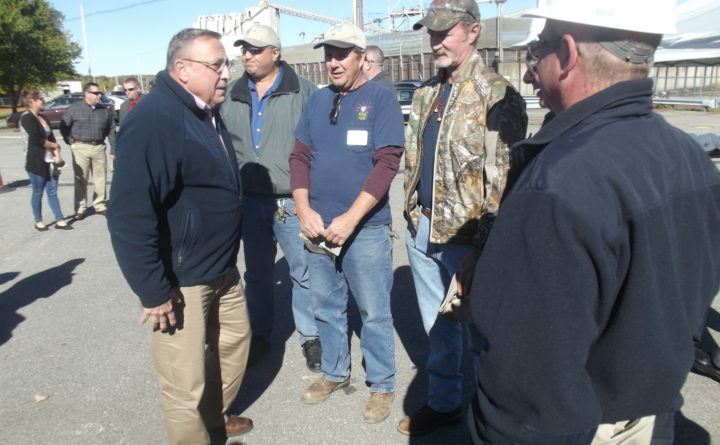 Paul LePage chats with union leaders following a groundbreaking ceremony for the new St. Croix Tissue plant in Baileyville, Oct. 10, 2014. Editor’s note: This story is part of a series examining Gov. Paul LePage’s legacy as his tenure comes to a close, including his impact on Maine’s politics, its social services and more. You can read the rest of the series here. When Republican Gov. Paul LePage added an “Open for Business” sign to greet motorists entering Maine during his second month in office, his political opponents dismissed it as a stunt. But almost eight years later, Maine business leaders generally agree it was more than a symbolic gesture and that LePage delivered on his campaign promise to improve the state’s business climate. While he struggled to keep Maine’s legacy paper industry viable or to seal some high-profile deals to lure global companies such as Airbus to Maine, he worked aggressively outside the public spotlight to make state government more responsive to business needs. Peter DelGreco saw him as a governor who took positive actions that few outside Maine’s business community normally see. DelGreco pointed to Collaborative Consulting, a Massachusetts information technology company that apparently wanted to expand beyond that state. Collaborative Consulting, which was bought by CGI Group in 2016, leased space in the Hains Building, a centerpiece of the downtown Waterville redevelopment project. The company plans to hire 200 people. DelGreco also pointed to Wayfair, a Massachusetts home goods company that now has offices in Bangor and at Brunswick Landing, with plans to hire close to 1,000 people. Steve Levesque, executive director of the Midcoast Regional Redevelopment Authority, which oversees Brunswick Landing, also credits the governor with helping the site of the former Brunswick Naval Air Station build from nothing to 120 businesses with more than 1,600 jobs. Brunswick Landing has received more than $350 million in public and private-sector investments during the past four years. Levesque also credited a change made under the LePage administration to the aviation use tax with boosting business. Before the tax code was changed in 2011, aircraft that came to Maine for more than 20 days per year had to pay a 5 percent use tax at the airport. Levesque, who served as the commissioner of the Maine Department of Economic and Community Development under then-Gov. Angus King (1995-2003), agreed with DelGreco that it makes a big difference with the business community when a governor comes to visit them. He noticed the power of such involvement by former Gov. John Baldacci (2003-2011) as well. Businesspeople said it is difficult to attribute a specific positive or negative business outcome to one person, even if that person is a governor. But they generally agreed that LePage’s tight fiscal hold on state government, especially as Maine was emerging from a deep recession more sl o wly than many other parts of the nation, instilled confidence within the state’s business community. Carl Flora, president and CEO of the Loring Development Authority in Limestone, said that while other events stole the attention, LePage, “was very concerned with trying to do things that could facilitate economic growth.” The former Air Force base now has 28 companies located there. LePage built a key part of his legacy by pushing through tax cuts and repaying the state’s multimillion-dollar debt to Maine hospitals. He also is known for discord with the Legislature and off-color remarks that received national attention. Maine Department of Labor data collected between January 2011, when he took office, and this year show job growth and lower unemployment during his administration. In January 2011, the civilian labor force was 697,917, with an unemployment rate of 8.1 percent and a participation rate of 64.8 percent. The participation rate is the percentage of the labor force age 16 to 64 that is working or seeking employment. That compared favorably with a total U.S. unemployment rate of 9.1 percent and a participation rate of 64.2 percent. The figures from October 2018 show that the civilian labor force in Maine grew to 705,463. The unemployment rate was 3.4 percent and the participation rate was 63.6 percent. Nationwide, the unemployment rate was 3.7 percent and the participation rate 60.6 percent. Maine’s gross domestic product, a measure of the state’s overall economic performance, also rose from $51.87 billion in 2011 to $61.7 billion in 2017, according to the Federal Reserve Bank of St. Louis. Maine has Moody’s third-highest bond rating of Aa2, which was the case in 2011 and 2018. The higher the bond rating, the more likely the issuer is to pay it back and the lower the risk of default. The state ended its most recent fiscal year on June 30 with a surplus of more than $175 million, according to the Maine Department of Administrative and Financial Services, which said the surplus indicates the state’s cash position is at record levels. The state carried financial reserves totaling $316.2 million into the current fiscal year. “Jobs created and growth in income are key indicators of how well the economy is doing, and he is in charge, so he gets the credit,” Levesque said. LePage also is not shy about touting his accomplishments and agenda. LePage studied business, finance and accounting at Husson University before earning a master of business administration from the University of Maine. He then worked in management positions at paper mills and Marden’s, a discount store. “He seemed strongest when he was working his way around the balance sheet with nuts and bolts and blocking and tackling,” DelGreco said. Janine Bisaillon-Cary, former president of the Maine International Trade Center from 2006 to 2017, got to see that firsthand when the governor was on overseas trade missions. “Because he came out of the private sector, he had a lot of comfort and business acumen,” Bisaillon-Cary said. “It definitely helps to have a governor on the international side who goes out and does talk about being interested in attracting foreign investment and meeting with business leaders,” she said. She said he played a big role in landing and growing Eimskip, the Icelandic shipping company that has transformed part of the Portland waterfront. The volume and value of shipments by container through the International Marine Terminal has more than doubled since Eimskip moved its U.S. headquarters to Portland in 2013, according to the Associated Press. Bisaillon-Cary said LePage and the Legislature supported an effort to promote new jobs through investment in trade ventures. Under LePage, she said the state developed the Maine North Atlantic Development Office in 2013 to land North Atlantic Region and Arctic region companies like Eimskip. LePage traveled on about eight of the international center’s trade missions, including an effort to woo International Grand Investment Corp., a U.S. company with a Hong Kong investment fund that bought the St. Croix mill in Baileyville and ultimately invested $180 million in it, including two new tissue machines that revitalized the mill. “I traveled twice to China to meet personally with the investors. Our productive meetings and the relationship we developed were an integral part of their decision to invest in Maine,” LePage wrote in a 2016 commentary for the Bangor Daily News. IGIC bought the mill in 2010 and added the two tissue machines, which created 80 jobs added to the existing 400 jobs. Bisaillon-Cary said LePage also traveled to Mexico to encourage an investment from a company that helped GAC Chemical of Searsport diversity its pigments into the paint industry at a time when GAC paper accounts were downsizing. She characterized the governor as a voracious reader who prepared for the overseas visits. “One-on-one he is pretty affable, interested and interesting,” she said. But on the flip side, “If the governor isn’t in accord with something, it is much harder to do,” Bisaillon-Cary said. One example is his essentially scuttling the offshore efforts by Statoil, a Norwegian company that wanted to test new floating turbine wind energy technology off the coast of Maine. LePage maintained Statoil wasn’t doing enough for the state’s economy and that costs of the pilot project would unfairly burden electricity ratepayers. Citing perceived hostility from LePage, Statoil pulled out of the planned test. The governor’s often combative stance with the Legislature and record-setting use of his veto pen also frustrated some Maine business leaders. “I am disappointed with his fight over bonds, including energy bonds,” said Kay Aikin, CEO of Introspective Systems, a Portland-based innovation company that uses artificial intelligence to help complex systems like energy microgrids make decisions about managing themselves. “But I do applaud his signing of MTAF, the Maine Technology Asset Fund,” she said. The $50 million bond, $45 million of which went to MTAF for investment in innovation and R&D, was approved by voters in November 2017. Aikin, who moved to Maine from Hawaii, said overall it is private investment and groups like the Maine Technology Institute, a publicly funded nonprofit organization that funds innovative companies in Maine. She said LePage didn’t have a negative or positive effect on business. Dana Connors, president of the Maine State Chamber of Commerce in Augusta, said LePage and the Legislature have done a lot to strengthen the foundation of the state’s economy during the past eight years, including reform of the pension system, paying hospital debt and decreasing individual income taxes. Overall, the administration’s tenure has been positive for the economy, Connors said. “Eight years ago people were looking for jobs. Today jobs are looking for people,” he said of the shortage of workers. However the governor’s outspoken demeanor may be what comes to mind first when his name is mentioned.